Knitting baby sweaters, cardigans and matinee jackets is one of my favourite things to do. They are usually made using one of the finer yarns (2, 3, or 4 ply), they are rather quick to knit and they can be just so beautiful! I cannot tell you how excited I was the first time my daughter-in-law finally asked me to make a few things for my grand-daughter. We are now up to grand-daughter #3 with grand-son #1 on the way! Michaela (my eldest grand-daughter) was so tiny - skinny but tall in proportion so at fifteen months old she was a size 0 around but needed a size 1 for length. She was either drowning in the jumpers you could buy for her or the sleeves and body are too short! That is the beauty of knitting, you can make the garments pretty much any shape or size you want. Michaela is way too old now for a matinee jacket, but I ham knitting two sweaters and a cardigan for her soon to arrive baby brother as I type. The finer the wool, the more knitting is involved. But in my opinion the finer baby wools are just perfect for baby wear. 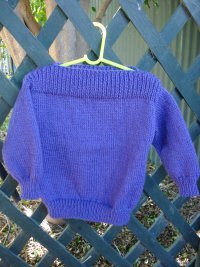 Garments knitted in 8 ply wools (or heavier weights) look a bit chunky to me on very little babies. For very small sizes, finer wools are generally better and a baby wool is going to be much softer than a standard 4 ply. Pick the wool to suit the purpose. If it needs to go in the washing machine and dryer, a synthetic yarn is better, but if you are prepared to hand wash and dry the old fashioned way, nothing beats a pure wool! Look for either a wide or an open neck, armhole shaping that gives plenty of room to get those little arms in! 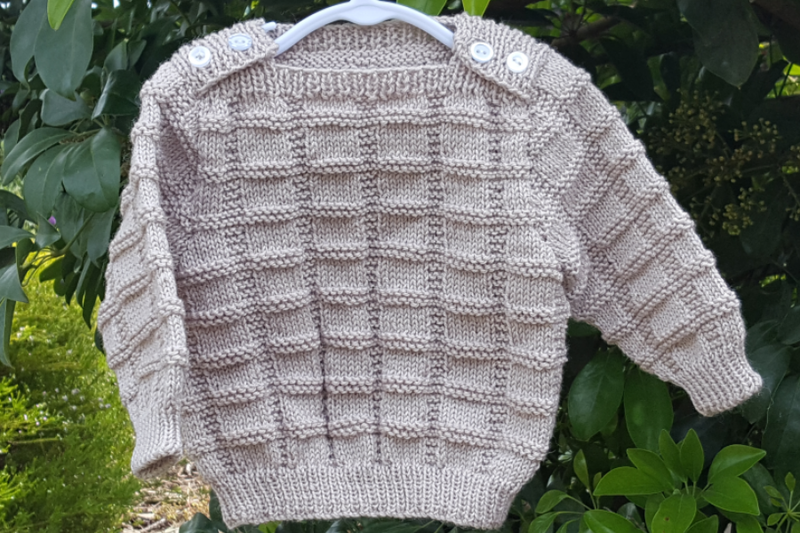 Many patterns can be modified to be knitted on circular needles in one piece to the armhole shaping so that you have fewer seams to irritate soft baby skins. The pattern has two sizes (18 inch -3 - 6 month and 20 inch - 6 - 12 month). 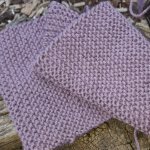 This pattern is free on the site and for your convenience, you can download a pdf version of the pattern. 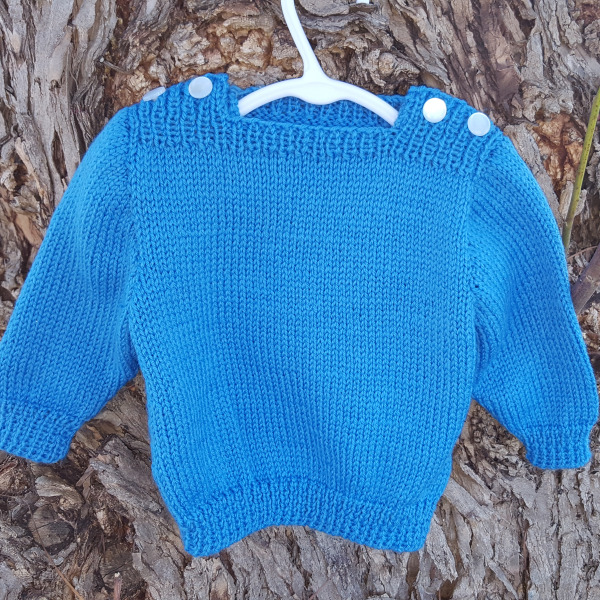 This cute little sweater features an open neck with buttons on either side to make it easier to get on and off your baby. It is knitted in 4 ply and has minimal shaping on the sleeves and at the armhole. Approximate sizing for this pattern is 000 (newborn to 3 months), 00 (3-6 months) and 0 (6-12 months), but remember not all babies are the same size at the same age. It might pay to check the infants chest measurement before you start knitting!